Giovanni Angelo Braschi was born on Christmas day in 1717 to an aristocratic and impoverished Italian family from Cesena. In 1735, at the age of seventeen, he graduated in law from Cesena. His first assignments were with Cardinal Ruffo, the legate of Ferrara, first as his secretary and later as the administrator of his dioceses. 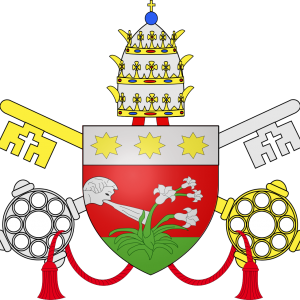 In 1753 Benedict XIV made him his private secretary and in 1758 a canon of St. Peter’s. Although engaged to be married, Braschi then became a priest and his fiancée entered a convent. 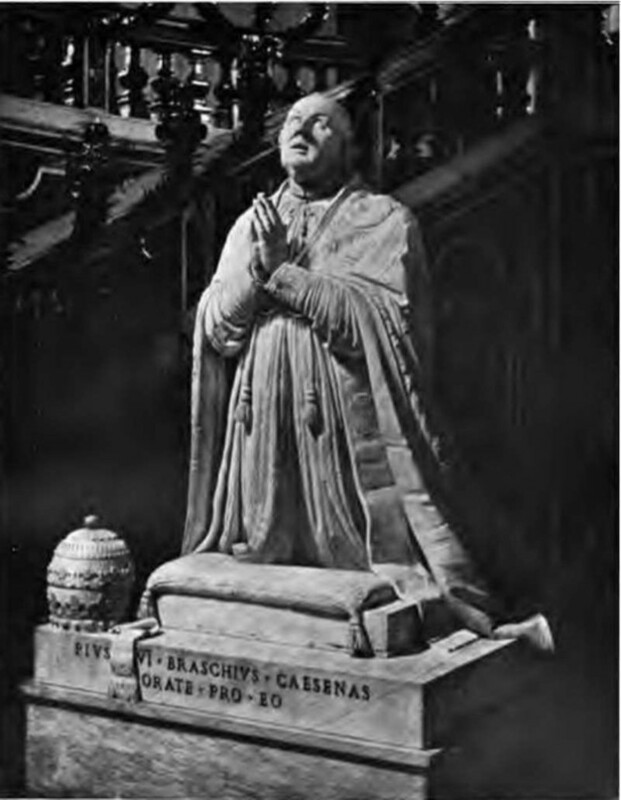 Clement XIII appointed him treasurer of the apostolic chamber and Clement XIV named him cardinal in 1773. Upon the death of Clement XIV late in 1774, Braschi was elected by a conclave that lasted nearly five months. 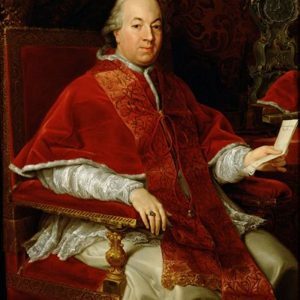 The cardinals were divided between those pro-Jesuit proponents who hoped a new pope would reverse the suppression issued by Clement XIV, and those anti-Jesuits with whom Braschi had made a verbal agreement to implement the policy. Braschi was elected in February of 1775. He was sixty-five years of age at the time of his election and would rule for nearly twenty-five years as Pius VI. Pius VI reigned during the most chaotic period of time since the Protestant Reformation. The Catholic powers had demanded from his predecessor, Clement XIV, the suppression of the Jesuits in 1773. Clement’s papacy was a weak one and people were enthralled by the Age of Enlightenment and revolution. The changes wrought by the dissolution of the Jesuits were short-lived and the Catholic monarchs across Europe continued to interfere with church prerogatives. Pius VI inherited this strained political climate. The prestige of the papacy, never lower, continued to plummet amidst the tide of secularism sweeping across Europe. It is said of Pius that he was concerned with pretentious displays and obsolete protocol. His personal failings included a reversion to nepotism and carelessness with the papal treasury. He gave substantial amounts of money to relatives and built the Palazzo Braschi for a favored nephew. The literature of the times praises his patronage of the arts. He spent lavishly in this area because he regarded the arts as a source of religious inspiration. He commissioned the sacristy of St. Peter’s in 1790. He improved roads and streets and drained marshland, which he then gave to nephews. 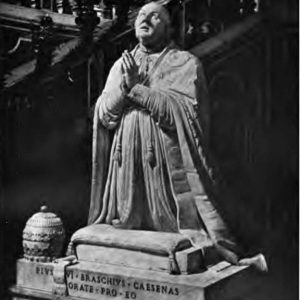 Pius promoted archaeological research in the Papal States, which greatly enhanced the collections of statues owned by the Vatican and deemed it necessary to continue the building of the Pio-Clementine Museum begun by Clement XIV. But these endeavors bankrupted the Vatican. 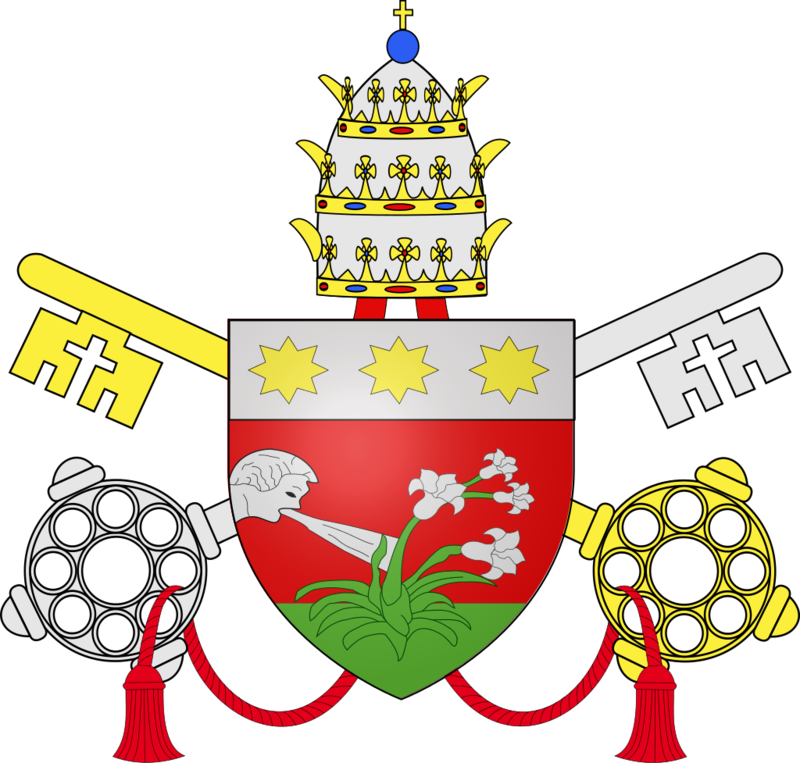 It is ironic that the plans to improve the economy and infrastructure of the Papal States, which he was unable to complete, were proposed by him when he was papal treasurer. In addition to his personal shortcomings, Pius VI faced grave historical challenges with which he was unable to deal effectively. The tide of secularism laid the base for the claims of governments to control churches in their realms. 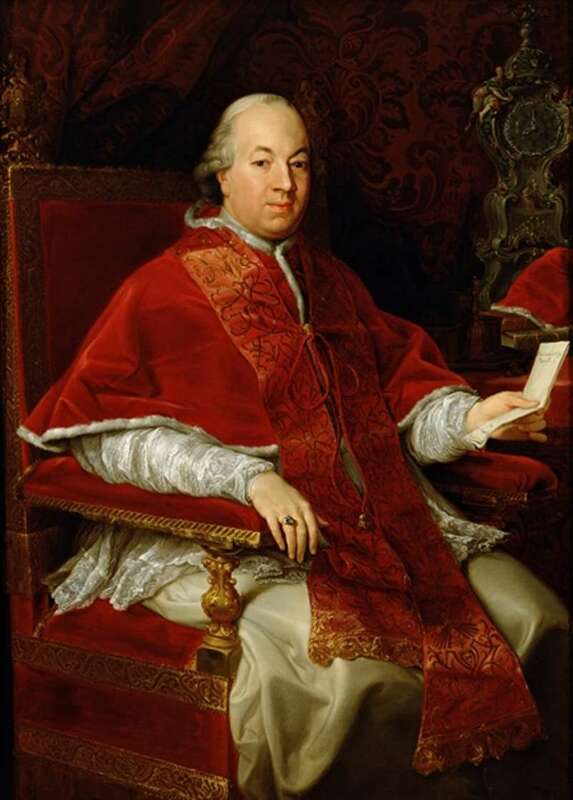 In the empire, Joseph II (1765 –1790) was influenced by Febronianism which held that the pope’s role in government had no basis in law, scripture or history. It further stated that all bishops stood equal to the pope, the bishop of Rome. Joseph’s attraction to this philosophy led to new dissent in Europe. The new ideas led to a loss of respect for the papacy. Furthermore, the adoption of the system of Josephinism meant complete religious toleration, restriction of papal rights to the spiritual sphere and subjection of Church rights to State rights. 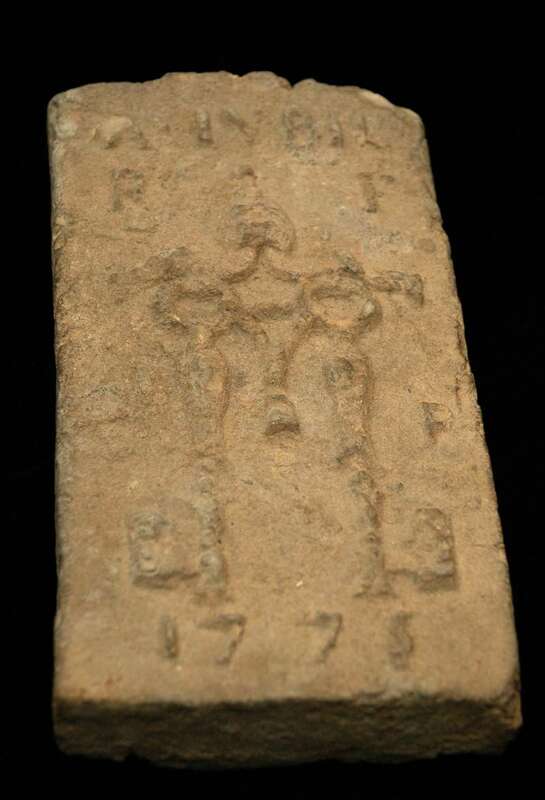 In an edict of 1781, Joseph suppressed religious orders and transferred certain monasteries from the jurisdiction of the pope to diocesan bishops. Pius VI suffered a grave humiliation when he traveled to Vienna to meet with the emperor, where he was received cordially, especially by the people, but granted no concessions. 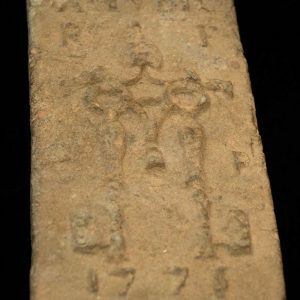 In 1781, he induced Bishop Johann von Hontheim,of Trier, whose pseudonym was Justinus Febronius, to make a formal retraction of the philosophy but it was a hollow victory as Febronianism continued to be practiced in the empire. Another humiliation occurred when Pius sent a nuncio to Munich, only to be defiantly informed by the German bishops that they controlled the German church and did not need papal intervention. In 1786, the German archbishops told him not to interfere in their jurisdiction. When Febronianism was introduced in Tuscany. Pius was able to force the bishop there to resign, thereby stopping the tide in at least one area. Then came the French Revolution in 1789. The French clergy became salaried employees of the State. Pius VI did not oppose this, but in 1791, the clergy were required to swear an oath of loyalty to the state. Pius did protest this time and relations deteriorated between France and the papacy. This was followed by the 1796 invasion of northern Italy by Napoleon Bonaparte with a plan to take over the Papal States. First, he entered Milan. Then he proclaimed his intention to restore the Roman republic. Pius was powerless to defend the Papal States due to the economic and military inadequacies of his papacy. The sad outcome was that Pius was forced to accept a humiliating and costly armistice. The provisions of the Treaty of Tolentino in 1797 transferred hundreds of works of art and manuscripts from the Vatican to collections in Paris. Along with them went the last vestiges of papal prestige. In 1797, a French general was killed during rioting in Rome and this became the excuse they needed to invade and occupy the Papal States, to proclaim a Roman republic and to depose Pius VI as the head of state. He was eighty years of age at the time and forced to flee for his life, seeking refuge first in Florence and then in other locations in Italy and France. In August of 1799, Pius VI died in exile, a prisoner of the French, in Valence. His last words were Lord forgive them. 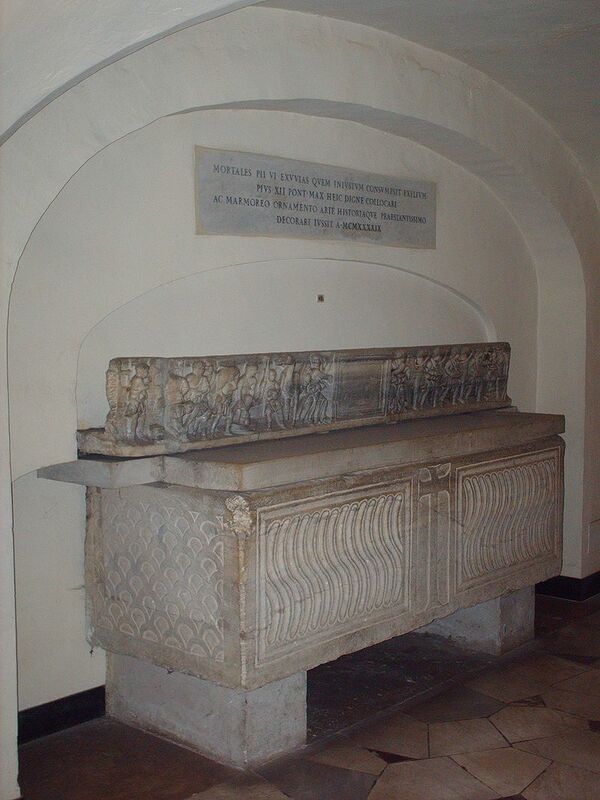 His remains were placed in a basement there but Napoleon himself saw to it they were moved to a cemetery. 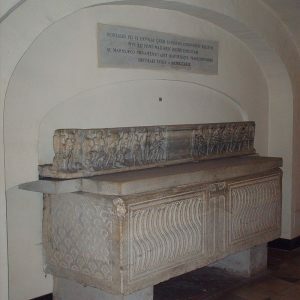 In 1802, he allowed Pius’ remains to be transferred to Rome. In 1822, a monument built by Canova was completed for him in St. Peter’s.